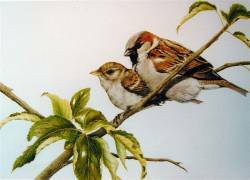 House Sparrow by Nicholas Day A chance to own a signed, limited edition picture, (only 50 printed), by a notable Wildlife Artist using an original medium.At an affordable price! Image shown of a "House Sparrows on Cherry Tree",in an acid free mount.Size of the print is 12" by 15"(38cm by 30.5cm)This is signed and numbered limited edition of 50 only.Printed to a very high resolution and standard, on superb quality paper with fast inks to guarantee total colour strength for at least 80 years under normal conditions.You will be very impressed with the price and the quality of this mounted print. House sparrow-(Passer domesticus) Noisy and gregarious, these cheerful exploiters of man's rubbish and wastefulness, have even managed to colonise most of the world. The ultimate opportunist perhaps, but now struggling to survive in the UK along with many other once common birds. They are clearly declining in both gardens and the wider countryside and their recent declines have earned them a place on the Red List. Where does it live? Breeding, Towns, villages, parks, gardens and industrial areas - usually nests on buildings holes and crevices, in creepers, trees and bushes and also in nestboxes. Wintering In winter it can be found in large flocks in farmland fields. They gather in trees and hedgerows and often roost communally in ivy-covered walls. Where to see it Found from the centre of cities to the farmland of the countryside, it feeds and breeds near to people. Vanishing from the centre of many cities, but not uncommon in most towns and villages. It is absent from parts of the Scottish Highlands and is thinly distributed in most upland areas. What does it sound like? Chirping and chirruping. Did you know? Many of the local names for house sparrows are varieties of 'spuggie' or 'spadger'. INTERNATIONAL ORDERS:International Orders will have additional shipping charges billed.